How do I create a File Upload assessment question using Quizzes.Next? 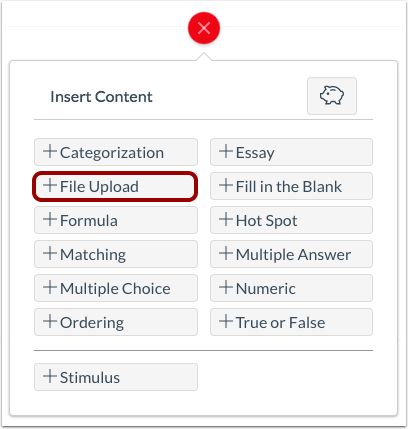 When creating an assessment, you can create a File Upload question in Quizzes.Next. You can limit the number of files and the file extensions that can be uploaded by students. 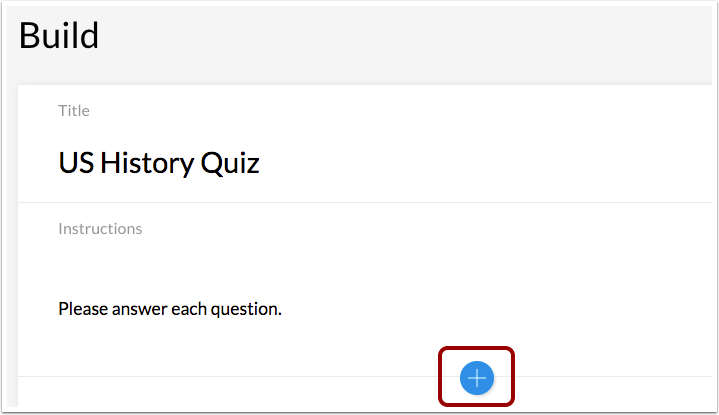 To create a question, click the Add button anywhere in the assessment. Click the Add File Upload button. In the Question Title field , add a question title. Question titles are optional and are not visible to students. In the Question Stem field , add the question stem. The question stem contains the question and, if necessary, additional instructions and information. You can use the Rich Content Editor to format and add content to your question stem. 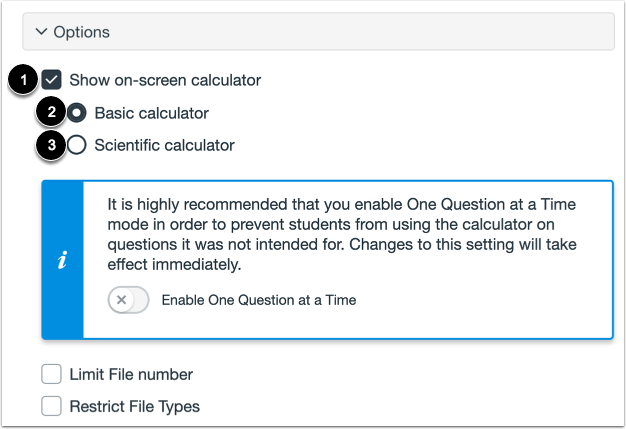 To allow students to use an on-screen calculator for this question, click the Show on-screen calculator checkbox . If you select this option, you can enable a basic calculator  or scientific calculator . The basic calculator displays numbers and basic math functions (add, subtract, multiply, divide). The scientific calculator displays more options for advanced calculations. Note: The on-screen calculator option is intended to be used while displaying one question at a time. If the assessment does not display one question at a time, students may be able to use the calculator for all questions. To limit the number of file uploads allowed for students, click the Limit File number checkbox . Then type the file number in the Number field  or use the arrows to increase or decrease the value . Note: If the Limit File number option is not selected, students are allowed unlimited uploads to a question. To restrict the file types that can be uploaded by students, click the Restrict File Types checkbox . Then enter the file extensions separated by commas in the File Types field . To align the question to an outcome, click anywhere in the Align to Outcomes section. To add the question to an item bank, click the Add to Bank link. Note: After a question has been added to an item bank, it can only be edited in the item bank. You can still set unique point values and options in the assessment for an item bank question. To customize the point value for the question, type the point value in the Points field  or use the arrows to increase or decrease the point value . To leave feedback for students, click the Feedback icon . To save the question, click the Done button. Previous Topic:How do I create an Essay question in Quizzes.Next? Next Topic:How do I create a Fill in the Blank question in Quizzes.Next? Table of Contents > Quizzes.Next > How do I create a File Upload assessment question using Quizzes.Next? Re: How do I make a timed assignment in Canvas?